Just as Women in SF&F Month has become an annual tradition, so has beginning the month of guest posts with one written by Renay! She’s one of several editors of the excellent site Lady Business, which I highly recommend visiting if you’re interested in discussion of speculative fiction in a variety of forms (including books, television, movies, games, and fanwork). Renay also writes articles for Strange Horizons, co-hosts Fangirl Happy Hour, and co-edited Speculative Fiction 2014: The Year’s Best Online Reviews, Essays and Commentary—and she came up with the idea for the ongoing Favorite SF&F Books by Women Project that you’ve perhaps seen linked in the sidebar of this site! 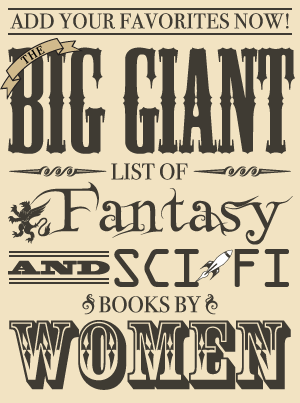 Welcome back to Women in Science Fiction & Fantasy Month! Once again Kristen is taking time out of her schedule to run this event and bring us some great essay writing, cool giveaways, and lots of recommendations. Thanks again, Kristen! ♥ As always, I’m extremely excited for this year’s event, because it involves one of my favorite pastimes: making lists! But we’ll come back to that in a moment. The genre community I knew when Kristen started this project has changed dramatically. Sometimes I look around and see the conversations about gender, gender identity, gender bias, and more, breaking the binary all over the place and go, “We’ve come so far. Wow. WOW.” Because I can’t imagine back in 2013 having a frank discussion about genderqueer or trans issues I see now in some of the spaces I do without it sinking like a stone or it becoming a sentient Don’t Read the Comments monster. So I’m proud of us because undoing decades of cultural biases is hard, slow, and constant work. We still have a long way to go, but we’re carving a new groove for ourselves and that’s excellent. Good work, team! As the community matured in how we discuss gender, other issues have cropped up, too. The problem with focusing on women in genre is that it can entrench the idea of a binary: a genre often historically defined by men becomes defined by women (often white women). And then we lose our ability to see marginalized genders and they become silenced and erased, which is the opposite of what we want to accomplish as we boost women’s voices. This all came to me in a big rush earlier this month when I sat down to plan what I was going to say during this opening post. This year I launched my most intense reading challenge yet. I was going to read 100 unique women writers who I had never read before, as long as the work was longer than 7500 words or collected in a trade comic/graphic novel. One week in, someone happened to ask me if I was only reading cisgender women, or if trans women counted and it brought me up short. I hadn’t really thought about it and in not thinking about it I had created a situation of accidental erasure. It brought up other questions about if people didn’t identify as women or men and then I went down a rabbit hole of gender that tangled me up for a few days. I decided that as long as I was aware of what I was doing I would read women writers who identified as women as part of my challenge. I would be very careful to not misgender anyone and include them by mistake, to ask questions when I was confused instead of assuming, and to respect boundaries if authors didn’t wish to disclose on their social media or to me personally if I happened to ask. I decided to be mindful of chances I had to read other marginalized genders, even if they didn’t count toward the challenge. It became a bit like an unofficial sub-challenge and it’s been working out great so far. Now that I’m aware of the issue, I’m more likely to check and see if someone of a marginalized gender has work that looks up my alley because it’s on my mind. A little awareness goes a long way and it’s not that much work at all to fold them into my inclusive reading practices that already exist. I came away from the examination of my project confident that women-only events are still worthwhile, especially in a noisy genre environment that can still and often does erase us. It’s okay to carve our space and time and energy for those of us who identify as women, love women writers, and are women writers. Focusing on our interests doesn’t necessarily mean having to accept a gender binary. Instead it gives us the opportunity to think about women and beyond, to challenge ourselves and our biases still caught up in binary thinking about gender, and to stay aware of the voices and perspectives we’re reading. What I’ve learned from the communities of women I’ve grown up inside and surrounded myself with is that we’re good at celebrating ourselves, but we also have hella skills in celebrating each other. Which brings me back to my favorite pastime: lists! I love a good list. “She loved recommendation lists. A LOT.” — my tombstone, probably. For several years now Kristen and I have been asking readers to step up and recommend 10 SFF novels by women writers you love and this year is no different, with some slight adjustments and a challenge! And as for the challenge: after you recommend the books you’ve loved recently by women writers, think about looking up some SFF by marginalized genders. Google for some rec lists, or if you know of authors, leave their names in the comments with some of their work (but don’t out anyone who isn’t ready!) so other readers can find them. There’s a quote that I see go around Twitter sometimes. It’s always unattributed but as far as I can tell it comes from Mary Church Terrell, and the version I see says, “Lift as you climb.” As women carve out a place in genre spaces formerly occupied and dominated by men to celebrate ourselves, I’m convinced we have to make this concept something we center as we move forward in order to clear a path to inclusiveness for all, along as many intersections as possible. Celebrate women and celebrate the marginalized genders who often are left out of projects where the binary could be engaged and the gender spectrum left behind, even in a positive way. Lift as you climb. It’s a pretty cool concept. So go forth and recommend the women writers who have most recently written amazing science fiction and fantasy flavored things that you loved! And be sure to discover new perspectives and new writers along the gender spectrum, too! It’s a big, literary world out there. Have fun making your list and enjoy all the amazing content about and from women writers that you’ll see over the next month!